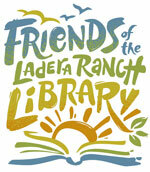 FRIENDS of the Ladera Ranch LIBRARY is generously participating in Literary Orange 2010 as a Gifts In Kind Sponsor. FRIENDS of the Ladera Ranch LIBRARY is a non-profit, volunteer organization. Our mission is to maintain an association of persons interested in books and libraries; to focus attention on library services, facilities, and needs; and to stimulate gifts of books, magazines, desirable collections, endowments, and bequests. All monies collected through special events and contributions will be used exclusively for library collections and the many projects that are not budgeted or funded by the Orange County Public Library. Proceeds of the FRIENDS of the Ladera Ranch LIBRARY Bookstore and fundraising events support our Ladera Ranch Public Library. The Friends Bookstore is located upstairs in the Ladera Ranch Orange County Public Library at 29551 Sienna Parkway. You’ll find fiction and non-fiction, paperbacks and hard covers, children’s books, best sellers, and more! Bookstore hours coincide with regular Library hours: Monday through Thursday, 10am-8pm and Saturday, 10am-5pm. Donations and volunteers are always welcome and very much appreciated!